Show your love and let's stock their fridge AND give them a Snack Bar like no other! * STUDENTS! We need YOUR help to decorate the PTA bulletin board! * One drawing from each class will be chosen to display on the PTA bulletin board. All others will be displayed in the teacher's lounge. 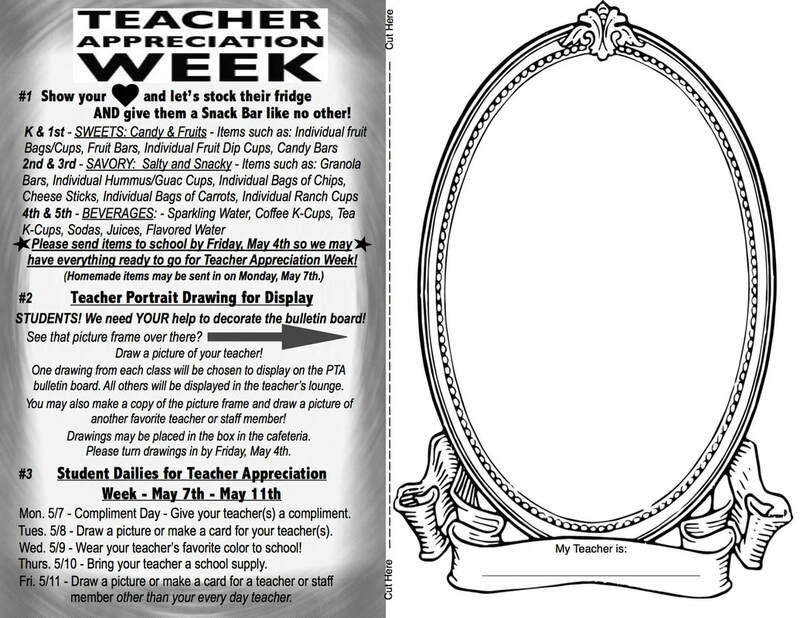 * You may also make a copy of the picture frame & draw a picture of another favorite teacher or staff member! * Drawings may be placed in the box in the cafeteria. * Please turn drawings in by Friday, May 4th. * Mon. 5/7 - Compliment Day - Give your teacher(s) a compliment. * Tues. 5/8 - Draw a picture or make a card for your teacher(s). * Wed. 5/9 - Wear your teacher's favorite color to school! * Thurs. 5/10 - Bring your teacher a school supply. *Fri. 5/11 - Draw a picture or make a card for a teacher or staff member other than your every day teacher. Here is the flyer that was sent home with students. Feel free to print!